Ideal for the next Lewis Hamilton or the complete beginner! Learn how to improve your lap time, how to overtake and defend your position, finally competing in a small event to test your skills. The school will consist of 4 consecutive days during a week of the Easter holidays. 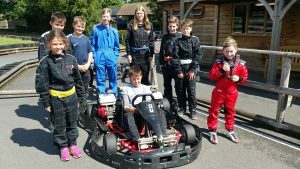 Arrival at 9:30am and lasting for 2 hours, we will teach all the basics of karting followed by continuous assessment to improve their skills. The final day will be a race event with the winners taking home a trophy. The Courses will be limited to 12 children so each child can have full attention, ages 8 to 16 years old, minimum height 1.3m. Cost is £120 for the week, ring 01544 318334 or email info@herefordshireraceway.org.uk for more details or to book your place on the grid!